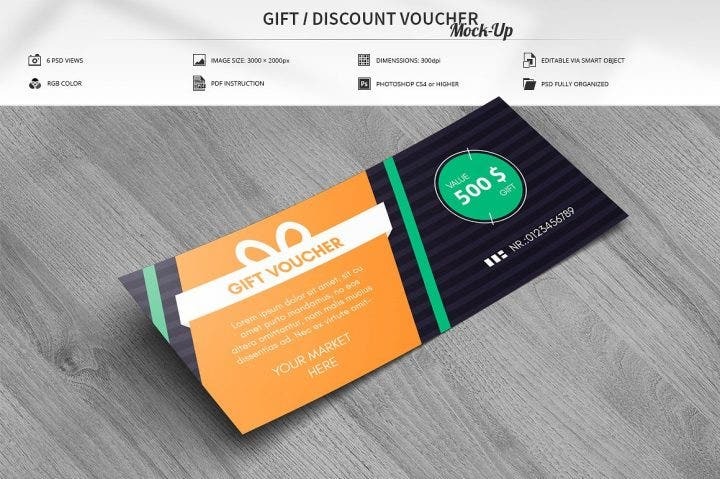 Vouchers are integral parts in the marketing strategy of any business. 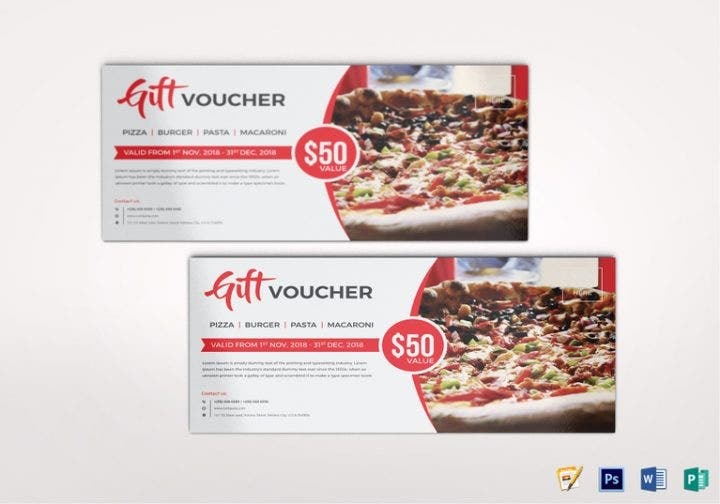 Compared to flyers and posters, vouchers are more geared toward customer retention. 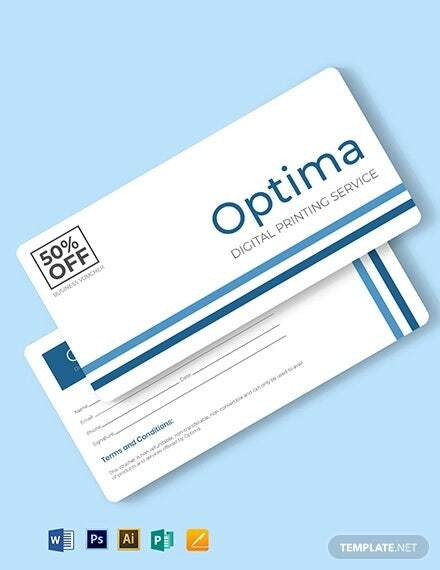 The great thing about vouchers is that companies are smart in making the coupon available for use only during the customer’s next visit, not on the customer’s current visit to make sure that she returns. 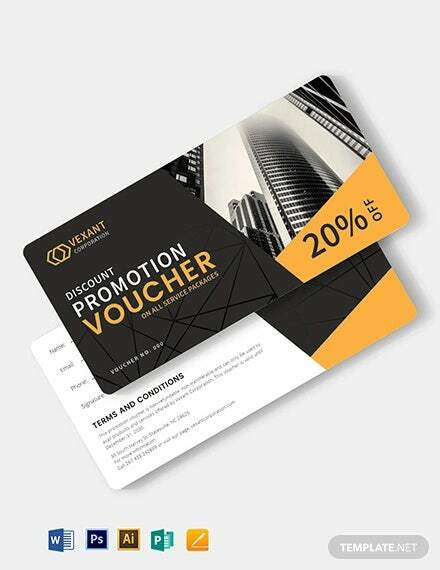 This is also a smart strategy used by companies for customers to not only avail of the voucher, but to purchase another product on their return visit. 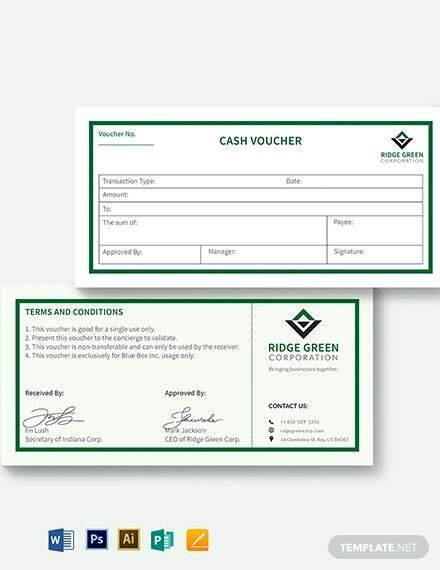 The importance of voucher designs cannot be downplayed in the long-term sustainability of any company, so here are some attractive yet very affordable business vouchers you can purchase and use for your own business. 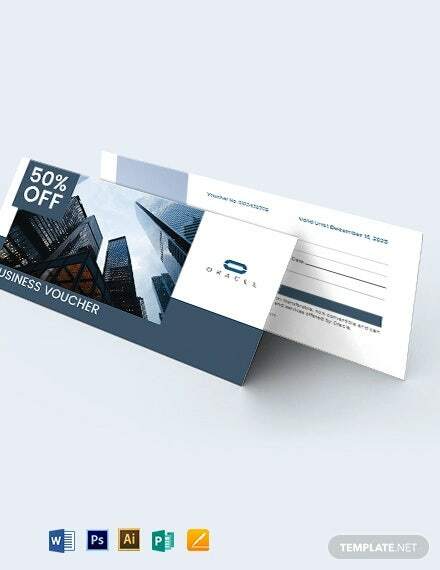 This business voucher has some beautiful designs that you can use for your own company promotion. The template has three available colors: brown, pink, and red. 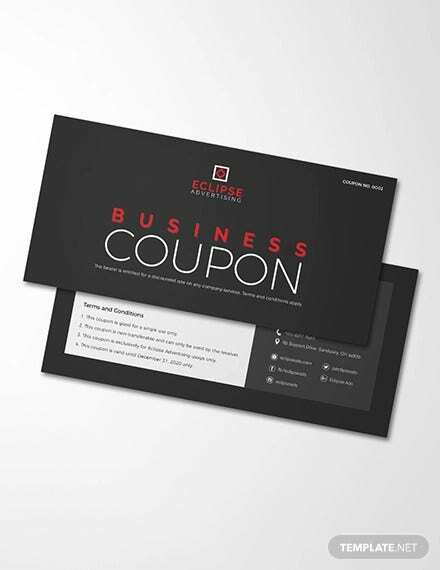 You can also insert your company or product image as well as the coupon’s value in this template. 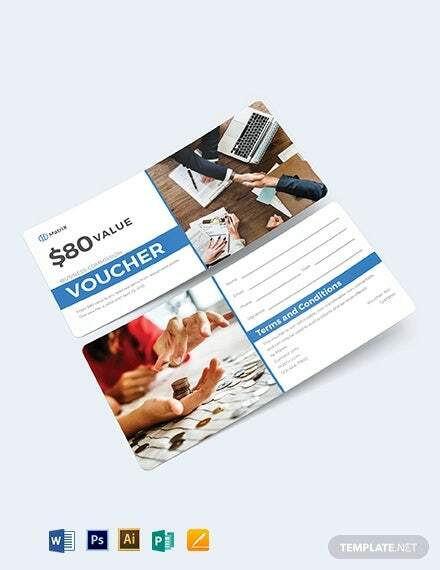 If you are looking for a professional yet very creative business voucher which can be used for any purpose, then this voucher is your best bet. 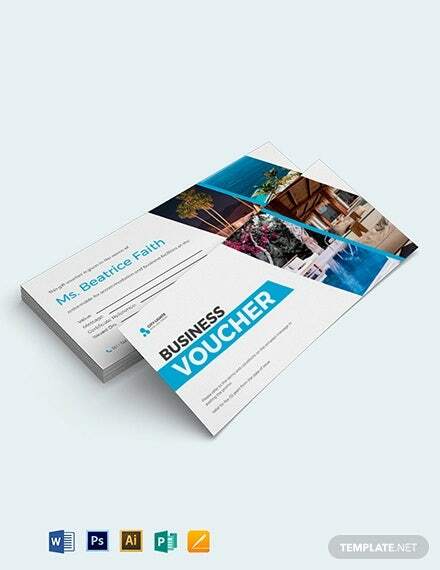 Your customers will certainly appreciate this business voucher template. 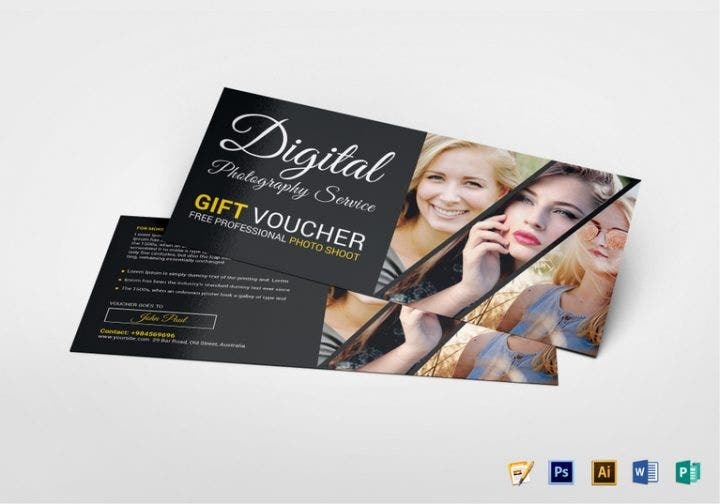 If you offer photography services, then this photo session gift voucher template is something that you should seriously consider. The template design uses some high resolution shots and the black background on the left side of the template has some very attractive gradients. Photography is one of the more popular businesses these days. More and more individuals have gone into photography not only as a hobby but as a form of income. This is because photography can be easily learned and the money-making potential is enormous. 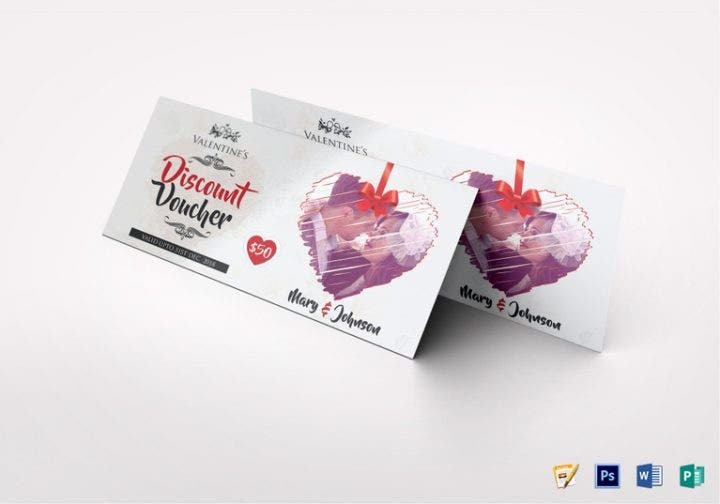 If you have some special promotions this Valentine’s for your company, then this Valentine discount voucher template is the best template for you. This template uses some elegant pink and purple shades to which you can add photos as seen in the template above. You can also edit the photos or images to fit your Valentine’s event. Valentine’s Day is one of the most profitable days of the year, next to Christmas and New Year. No matter what industry you are in, there is always potential to earn. Take advantage of the situation and purchase this Valentine’s template now. 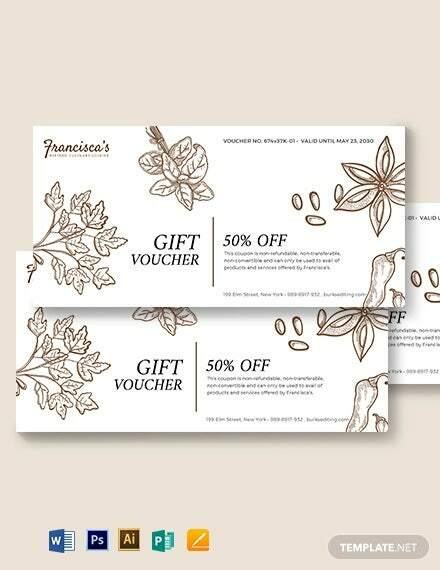 This shopping voucher gift template can be used for any company in any season. This template uses some beautiful circular gradients and can fit any company promotion. Insert your company logo in the front cover of the template and edit the coupon’s value at the back. The orange gradients are also very attractive and provide much needed color in the template. This unique gift voucher template uses some beautiful food photography which you can edit for your own restaurant or food business. The template uses some magnificent red shades which you can also edit to fit your own dishes. Look for dishes in your menu which have some red-colored ingredients and integrate it in this template. Similar to the other templates, there is a section where you can add and edit the text. 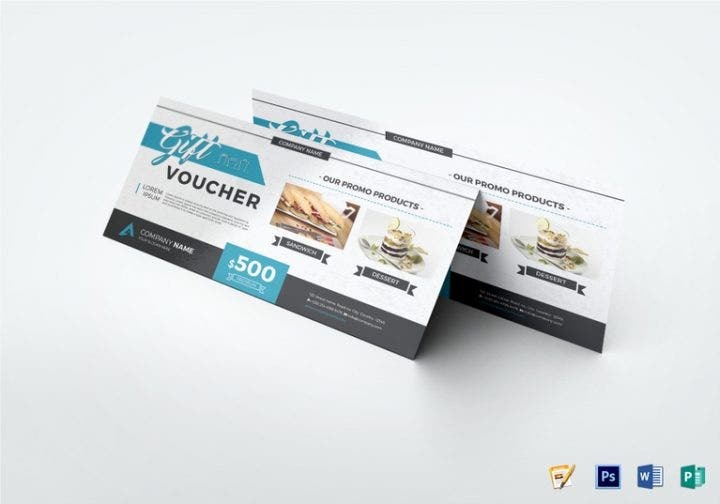 This modern gift voucher template uses some flat and contemporary designs that are very common in graphic designs these days. Graphic designs are fast-evolving. It was only around ten years ago when gradients, embossing, and drop shadows dominated graphic design, but technology and customer preferences have changed quickly. Now, designers are going back to the basics and using more simpler (flat) designs. 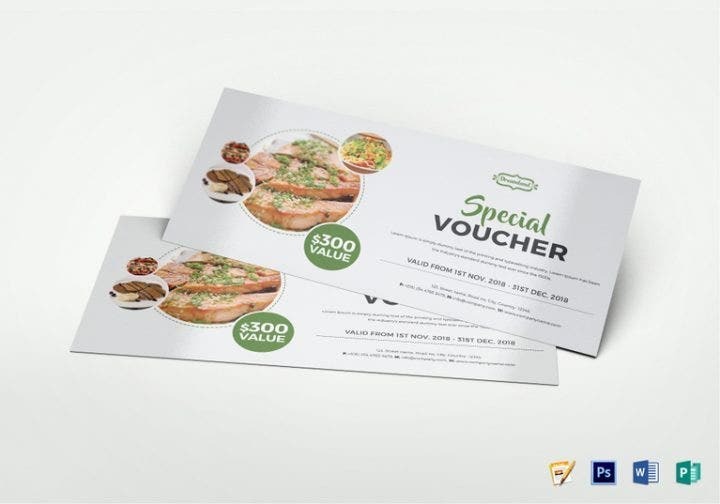 This is another modern food voucher template that you can use for your own restaurant. Similar to the other template, this template uses a flat and minimalist design which is very common in graphic designs these days. The template uses a green shade which can fit the vegetable dishes in your restaurant. The sample image used in the template above is some slices of bread with garlic and basil. Use a similar image from your restaurant menu (salad or vegetable dish) if you are planning to use this template. 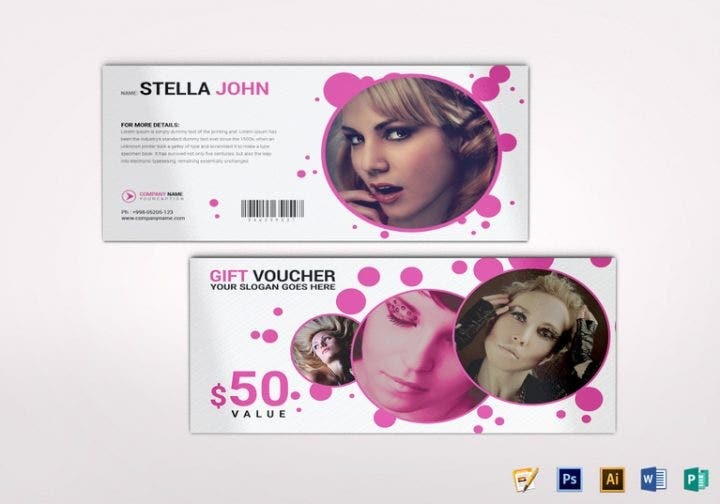 If you are selling some designer brands, then this fashion gift voucher template is something you should consider purchasing. The pink hues are often associated with fashion and the color perfectly matches the coupon design. Retail clothing is one of the most profitable businesses in the world, so do not lose out on the competition and start giving out these coupons. This gift voucher template is something you should purchase this holiday season. 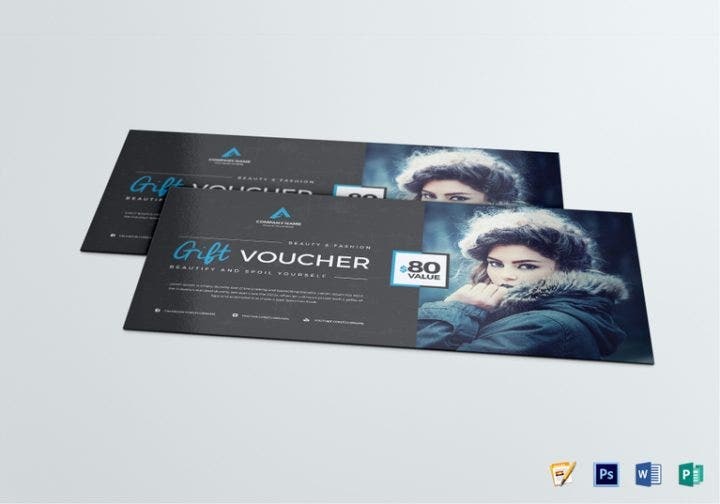 The blue and black background paired with the winter attire image is the perfect template for Christmas. 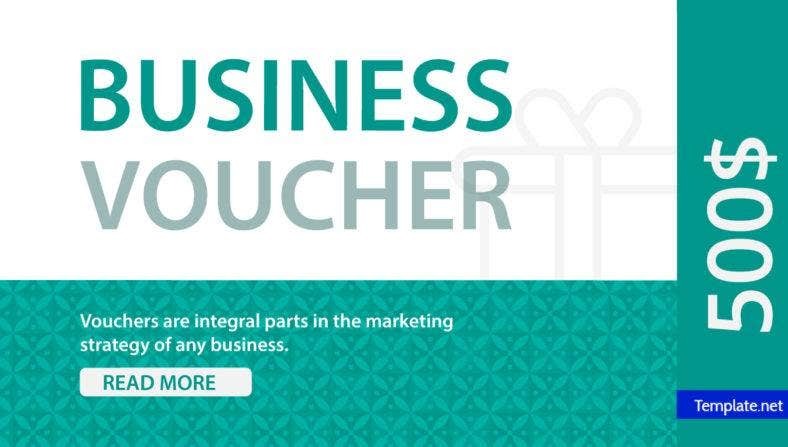 Edit the image to fit your own business voucher. 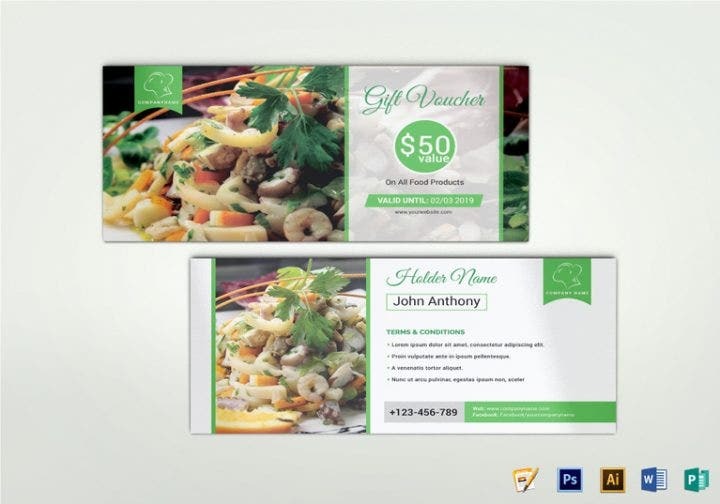 This food gift voucher template is another template which uses beautiful food photography. The food image takes up most of the space in this template, but it still produces a very attractive design. This minimal gift voucher uses a minimalist design that still looks attractive nonetheless. 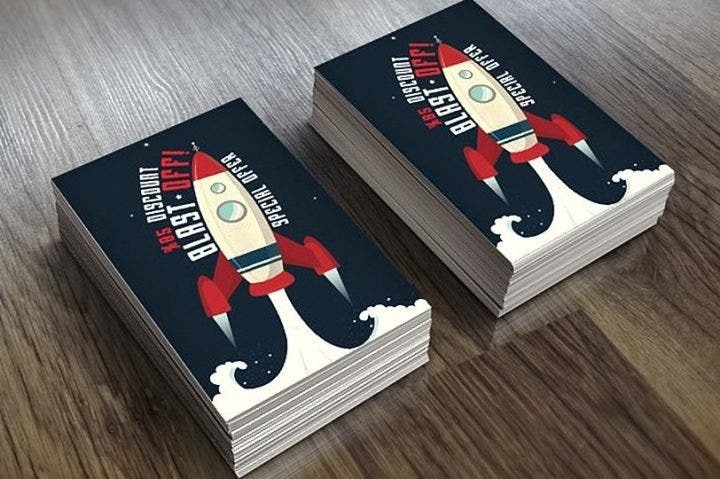 An image of a cartoon rocket ship is used as the central design of this template. As previously mentioned, minimalist designs have taken over graphic design and look to stay that way for the next few years. 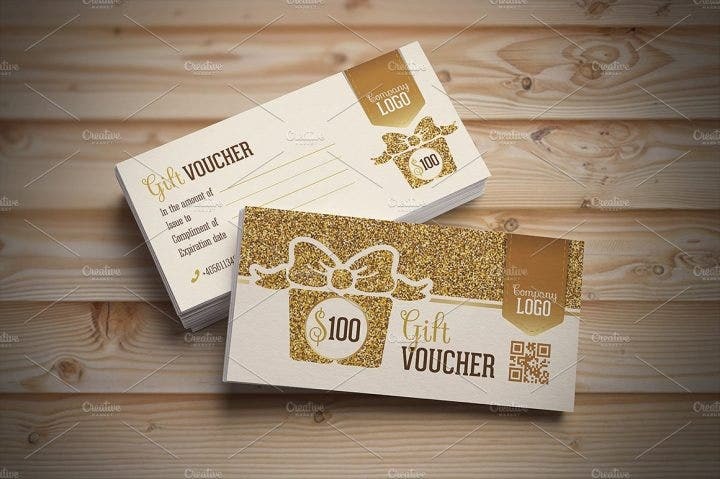 This creative gift voucher template uses some very attractive art depicting a woman wearing a cowboy hat and holding a gun. Pink, yellow, and blue smoke effects are used to add to the template’s visual appeal. 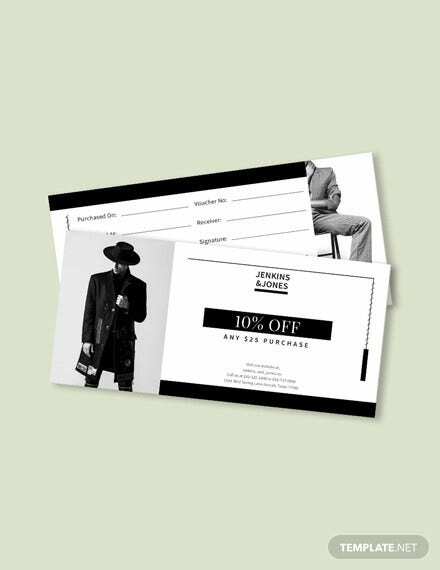 This template is best used for retail clothing stores, but you can still use this for your own business voucher promotion. Gold is the best color to use for any design. It matches any color and can be used for any look. This gold gift voucher template is testament to that with its sparkling gold designs. Purchase this now and leave your customers in awe with this beautiful gold voucher template. The beauty of using gold colors is that it can match any event and occasion, so that if you are planning to use some designs or colors, go with gold first. This multi-colored voucher template is available in four colors (red, violet, blue, and green). 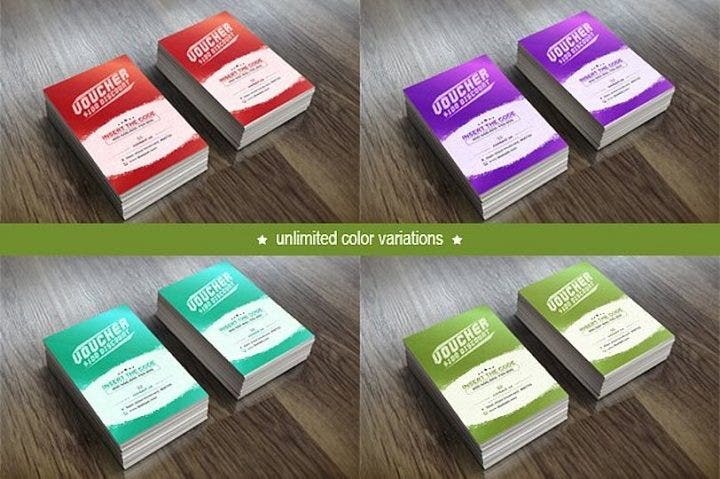 Pick one or all colors for your business voucher. If you purchase all designs, you have one color for each company event or promotion. 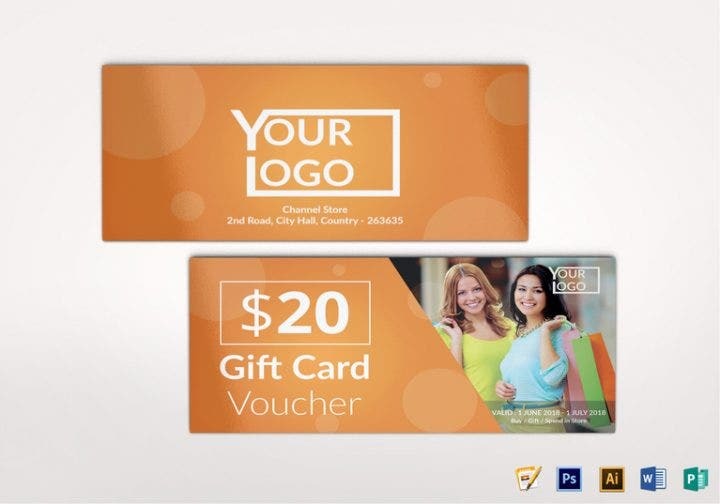 This gift or discount voucher mock-up also uses some beautiful color designs which you can use for your own company promotion. 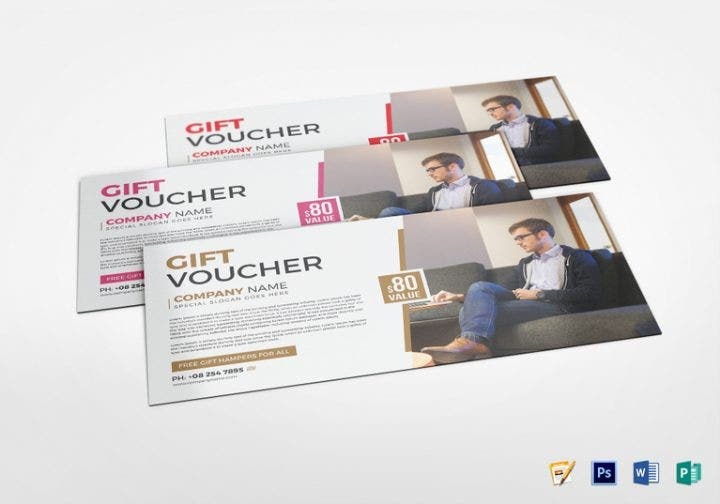 Add more creativity to your business vouchers by having alternate designs. 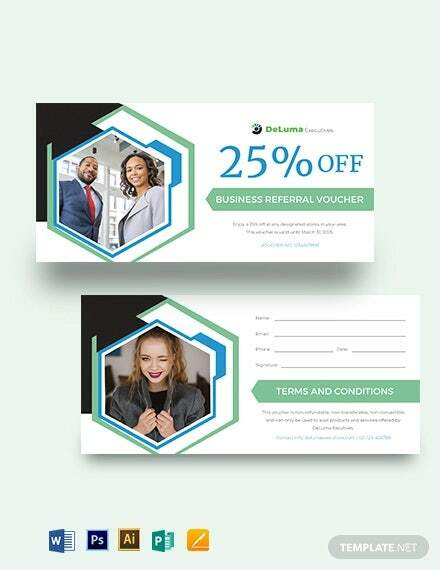 Do not settle for just one business voucher design for your next project or promotion, but have other designs on hand which you will be giving out to your customers. For example, if you are a retail shoe store handing out discounts on your signature shoes, you can use different color schemes for your business vouchers. You can use red for one design and maybe blue or yellow for the other. Additionally, you can use different images or photos in your alternate designs. There is no limit on the designs you can use since you will now be producing two or more designs. Having two or more alternate designs will be appreciated by your customers or clients especially if they have the option to choose from the designs you have presented to them. So, choose your favorite voucher now!